Oooh! I see folks posting about the comics today. Well I wanna play too! My most recent acquisition is House of Mystery and Voodoo. House of Mystery is based on the classic series and written by Bill Willingham (Fables), Cain's house has disappeared and an unlikely group of strangers/friends are inhabiting it. I've got the first tradeback and it is wonderful! Voodoo published through DC about a mysterious alien woman. Just finished volume two in trade and it is quite exciting and action packed. The inking and drawing are quite smooth and the lines are long. Story moves along nicely. 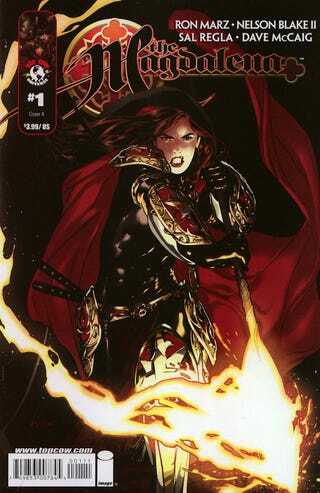 Magdalena which a spin off from Darkness and Witchblade about warriors of the church who are descendants of Mary Magdalene. Great writing, lots of church related conspiracy and legend. Artwork is over all excellent, similar to the Voodoo style. Glossy. Justice League Dark staring Zantanna, John Constantine, Deadman, and others. Just great! The Occult. Zantanna. The artwork here is much softer more dreamy. Very clean. Love. Black Lantern Corps series. The resurrection of certain characters in the Lantern universe. And following the yellow, red, etc. Great stuff. Very tense. 1602Neil Gaiman just read the first two issues and I'm not 100% clear what's going on but I love it.